Southern State Community College honorees in the annual AOC Recognition Celebration include (first row, l-r) Elisha Heintz, Skylar Drott, Constance Bradley, April Barber, Crissa Hughes, Alicia Stack, Anna Stephenson, Samantha Matthews; (second row, l-r) Maleah Gibson, Katelyn Stoffel, Michael Collett, Anthony Lewis, Isaac Schmidt, David Troyer, Donna Roberts; (third row, l-r) Shanna Hahn, Scott Lewis, Janet Littleton, Brandon Zornes, Jeffrey Patrick II, Samantha Evans, and Tyler McMillion. Samantha Nicole Marian was the guest speaker at the Southern State AOC celebration. Area residents who passed the General Education Development (GED) test were honored recently at the 30th annual Adult Opportunity Center’s Recognition Celebration at the Southern State Community College Central Campus in Hillsboro. For the 2017-18 academic year, the Adult Opportunity Center served 439 students. Of those students, 366 enrolled in one of the AOC classes and almost 67 percent improved at least one level. So far, 53 students have received their GEDs, and many have already started their college careers at Southern State. Guest speaker Samantha Nicole Marian was invited to address this year’s honorees. Marian shared her decision to enroll in GED prep classes at Southern State. “Tonight I’m going to tell you my story and I wanted to come up with a way to do that without going into too much detail. So I decided to come up with a list of words that would describe me after being assaulted at a young age, after the loss of my father, after being kicked out by my mother, prior to getting my GED, prior to leaving my second abusive relationship. “Here are those words I would use to describe myself, some beautiful, some not so much: Mother, daughter, sister, victim, broken, alone, abandoned, unwanted, unworthy, hopeless, useless, stupid, failure, shattered, coward. “My plan was to go to school, graduate, go to college and become an RN, get my dream job, meet the man of my dreams, get married, raise a family. But that’s not what happened, Marian said. “I was only 15 years old when I became a mother. Due to complications with my pregnancy, I was no longer able to attend school. I had to stay home and do home instruction through the remainder of eighth grade. “After my son was born, I went to my school and showed them an online program I’d found that would allow me to finish high school. They approved the program. I worked really hard and I finished right along with the rest of my class. I was very proud of this accomplishment. “Right before my 26th birthday, I started thinking about who I was and where I was at in life and where I wanted to be,” she continued. “I wanted to give my kids a better life. And I knew in order to do that, I would have to go to college. However, eight years and two kids later, I found out that my high school diploma was a scam. “It was devastating and I felt like a fool and a failure. I thought my chance to go to college was really over. It took me awhile to even consider getting my GED. “I finally did what I needed to do, packed my kids up and moved to another town. I got a job working 40-50 hours a week in a factory,” she said. “I finally swallowed my pride and began looking for help in attaining my GED. Of all places to find GED classes, I found it on Facebook. I saw a post that said there were going to be free GED classes at Southern State Community College. I signed up for the program. And it was the best decision I could’ve made for myself and my children. “I started classes at the end of March and my pre-test scores indicated I had mastered many skills and I would be able to pass my GED. But I didn’t feel ready. 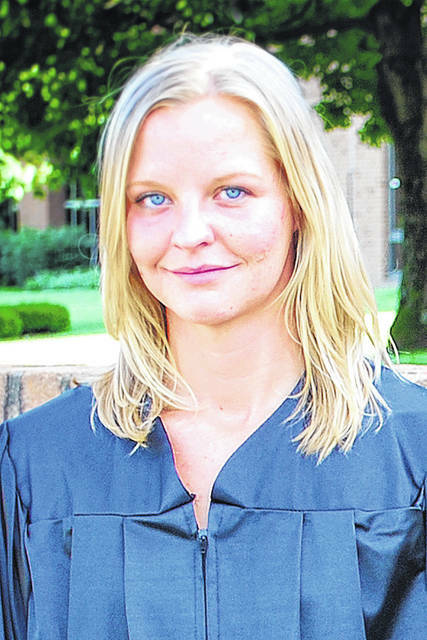 “But I wanted to move on with my life, so I talked to an advisor at Maysville Community & Technical College, and learned that in order for me to start college that fall, I would need to get my GED, apply for financial aid, apply for admittance, and take a placement test, and I only had 24 days to get all this done. “I talked to my teachers [in the GED program] and told them what I wanted to do. And they did what they do best – they gave me the support and the encouragement to believe that I could do it. They helped me study and prepare for my tests until I felt confident. “I took the first two tests in one day. I passed them both. That night I was back in the classroom with my teachers studying and preparing for the final two tests. Just two days later, I took the last two tests and I passed them. I did it – I got my GED. “What I thought was impossible to do in 24 days, I got done in 14. “My entire first semester of college was terrifying. Every day I thought there’s no way I can do this, I’m going to have to drop classes. But I got a 4.0 grade point average. I had straight A’s. “A few days later, there was a letter from MCTC. I was accepted into the RN program. I was picked. First round. Following Marian’s speech, Karyn Evans, dean of SSCC’s Adult Opportunity Center, said that – counting the 2017-18 class – more than 20,000 students have now been served since the program’s inception. Evans then announced the names of honor students who achieved high scores on the tests: Samantha Marian (social studies), April Barber (science) and Elisha Heintz (math). A Trustee Scholarship for three college credit hours is awarded to any student who successfully passes the GED. Trustee Honor Scholarships, awarded to the highest scorers from their respective counties, were presented to Alicia Slack, Maleah Gibson and April Barber. The annual Friends of Aspire Award was presented to Ted Groman of the Clermont County Ohio Means Jobs. GED preparation is offered free of charge through the Aspire program at Southern State’s Adult Opportunity Center (AOC), under the direction of Karyn Evans, with assistance from staff, instructors and volunteers. Through Southern State’s Adult Opportunity Center, Aspire classes are free and offered on each campus and in several off-campus locations. All books and materials are provided. Morning and evening classes are available for adult literacy, GED preparation, nursing program preparation, college refresher courses, workforce education, and reading, writing and math improvement. Southern State’s Aspire program is a state and federally funded program offered at no charge to participants. Orientation is the first step for all enrolling students and pre-registration is required. For more information, visit www.sscc.edu/specialized/aoc.shtml or contact Southern State’s Adult Opportunity Center at 1-800-628-7722, ext. 2687. Submitted by Kris Cross, director of public relations, SSCC. https://www.timesgazette.com/wp-content/uploads/sites/33/2018/08/web1_AOC-pic-1.jpgSouthern State Community College honorees in the annual AOC Recognition Celebration include (first row, l-r) Elisha Heintz, Skylar Drott, Constance Bradley, April Barber, Crissa Hughes, Alicia Stack, Anna Stephenson, Samantha Matthews; (second row, l-r) Maleah Gibson, Katelyn Stoffel, Michael Collett, Anthony Lewis, Isaac Schmidt, David Troyer, Donna Roberts; (third row, l-r) Shanna Hahn, Scott Lewis, Janet Littleton, Brandon Zornes, Jeffrey Patrick II, Samantha Evans, and Tyler McMillion. https://www.timesgazette.com/wp-content/uploads/sites/33/2018/08/web1_AOC-pic-2.jpgSamantha Nicole Marian was the guest speaker at the Southern State AOC celebration.